Is President Vladimir Putin amenable to the idea of losing Russia’s naval facility in the Syrian port of Tartus and gaining access to the warm waters of the Mediterranean through Turkey instead? Murat Yetkin, the influential editor-in-chief of Turkey’s Hurriyet Daily News, mooted the option this morning. 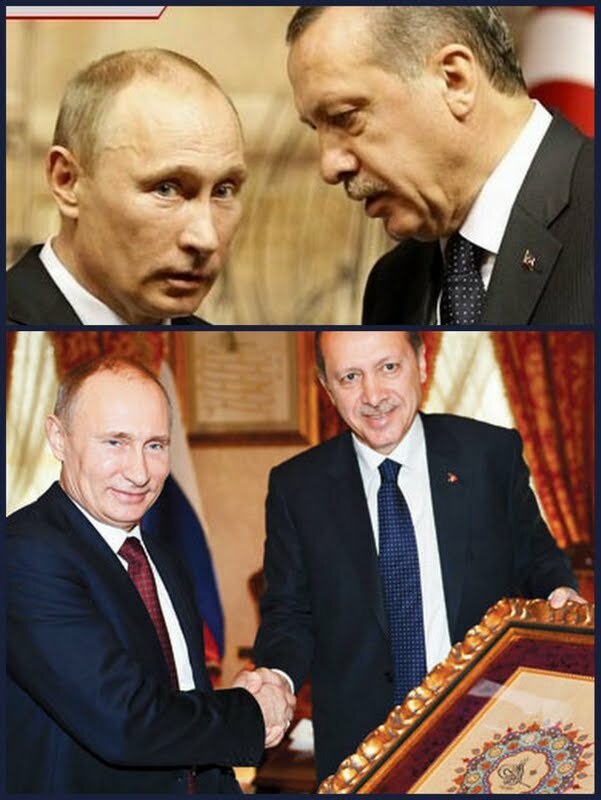 Putin yesterday said Russia is working with Turkey to resolve the ongoing crisis in Syria. He made the comment after his talks with Turkish Prime Minister Recep Tayyip Erdogan in Istanbul during a one-day visit. Talking at a joint news conference following the two leaders' meeting, Putin sought to distance himself from Damascus. He said, “The positions of the Russian Federation and Turkey completely correspond regarding what has to be attained (in Syria), but there is no shared approach as yet on the methods” to realize it. “We discussed this issue today with our Turkish colleagues, and came up with some new ideas, which require further analysis and planning,” the president said. Erdogan told the press conference Turkey and Russia shared a “strategic perspective” that has put a stamp on their bilateral ties. “Our multi-dimensional [agreement] on the Black Sea Basin is the best example of the strategic perspective between the two countries,” Erdogan said. The two leaders were anxious to send a message that differences over Syria will not undermine deepening relations that are underpinned by a rapidly growing trade relationship. During the Russian president's visit, a number of trade and diplomatic agreements were signed, and a commitment was made to almost triple the current 30-to-40 billion dollars in trade to $100 billion. Turkish entrepreneurs have made investments of more than $10 billion in Russia, said Erdogan. He said Turkish construction companies have taken on 1,400 projects worth $40 billion in Russia. Erdogan also praised Russia’s $700 million capital flow to Turkey for the construction of the Akkuyu Nuclear Power Plant project. A senior Turkish official told The New York Times Moscow was "softening" its "political tone" and would look for ways of getting Assad to leave power. Russian Deputy Foreign Minister Mikhail Bogdanov said for the first time Moscow was ready to evacuate thousands of its citizens from Syria in case of emergency. "We’ve got plans for every situation and have got a clear idea where our citizens are located," Bogdanov told the Itar-Tass news agency. He said the Russian embassy has been in contact with Russian citizens in various areas of Syria. They are mostly Russian women married to Syrian nationals or diplomatic staff. "In any case, several planes will be needed. There are capabilities for that," he added. According to Bogdanov, Russian citizens may also leave Syria via Lebanon or Jordan. "I don't see any real problems with that now," he said, adding: "Due to the situation, we recommend Russian citizens not to go to Syria." The United Nations also began pulling out non-essential staff from Syria and the European Union said it reduced activities in Damascus "to a minimum" as regime forces bombarded opposition strongholds with artillery and airstrikes in an increasingly desperate attempt to keep rebel forces from advancing into Damascus, the capital. The Russian empire’s quest for “warm waters” was adopted as strategic policy a century earlier under Peter the Great. In Soviet times, Josef Stalin espoused the same strategy. “That is why the Turkish straits and the Turkish-Soviet border (as the north-east-southwest corridor down to the Mediterranean) was considered a key strategic point of Western defense,” once Turkey joined NATO in 1952. Putin can consider himself the inheritor of Peter the Great’s policy of gaining access to the warm waters of the Mediterranean Sea -- not through war, but rather through cooperation for more trade. Both the visiting Russian president and Erdogan voiced a shared “strategic” view of Putin’s visit. That is an impressive plus for the prime minister of a NATO country. “Erdogan and Putin signed 11 cooperation agreements, from the opening up of Turkish and Russian cultural promotion houses to a $20 billion nuclear power plant that will be built in Akkuyu, on the Turkish Mediterranean coast. “Erdogan said both countries targeted raising bilateral Turkish-Russian trade to over $100 billion dollars - from the current nearly $40 billion - over the next seven to eight years. “Russia is already Turkey’s number one trading partner (on cumulative basis it is the European Union) and the main trade item in this balance is Russian gas and oil. Turkey is dependent on Russian gas for its electricity production more than Russians themselves, and this dependency might become deeper with the sanctions on Iran. Turkey is eyeing Russian gas and oil to compensate for the loss from Iran over the winter months. “With nearly 4 million Russian tourists rushing to Turkish Mediterranean resorts every year and ever increasing Turkish-Russian marriages, this long-range relationship makes discrepancies over Syria, for example, smaller than they actually are. “For the first time, Putin was very clear in saying Russia was not an advocate for the regime in Syria, and one may expect a quicker disintegration of the Damascus regime following these words.